Deladenus siricidicola is a nematode parasite of the Sirex woodwasp (Sirex noctilio, Hymenoptera: Siricidae), an invasive pest of pine (Pinus spp.) trees. 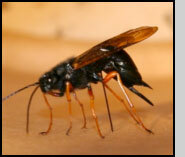 S. noctilio, also called the Sirex woodwasp, is a native wood boring wasp of Eurasia/North Africa, where it is not considered a pest. However, it is an invasive pest of pine trees in many other parts of the world. It was detected in New Zealand in the early 1900s, and in Tasmania and Australia by the 1950s and 1960s. By the 1980s it had moved to South America, it was in South Africa by the 1990s, and it finally was detected in North America in 2004. In the Southern Hemisphere, around 8 million hectares of exotic pine plantations are threatened by the pest. In Australia it is estimated that, uncontrolled, the wasp could cost 16-60 million US dollars per year, and in Brazil an estimated 6.6 million US dollars per year could be lost if their control program were not in place. In the Southern US, there is an 8 billion US dollar per year pine industry that could be threatened if S. noctilio establishes in that region. S. noctilio is a wood boring wasp which kills pine trees through the use of a symbiotic, tree-pathogenic fungus (Amylostereum areolatum) along with a phytotoxic mucous, which are injected into the tree along with eggs during oviposition. The mucous inhibits the tree’s ability to fend off attack from the fungus, which grows throughout the wood and causes lethal wilt of the tree. As the tree is killed, the needles, particularly at the crown, droop and turn brown. A tree can be killed in as little time as a year, being rotted by the fungus. Meanwhile, eggs deposited in the wood hatch and larvae feed on the decaying wood. S. noctilio take 1-2 years to develop to adulthood, depending on the location of the infestation, at which point adults emerge, mate, and infest new trees. D. siricidicola has two morphologically different forms—a fungal feeding form and a parasitic form. The fungal feeding form lives in the pine tree and eats the symbiotic fungus injected into the tree by an adult S. noctilio female. While in this form in the tree, the nematode can reproduce for many generations in the absence of the woodwasp as it spreads throughout the tree. If, however, the nematodes detect the presence of S. noctilio larvae, they develop into parasitic adults. These infective adults penetrate the S. noctilio larvae and produce offspring, which migrate as juveniles into the reproductive organs of the host. Nematodes eventually make their way into the eggs of S. noctilio before the shells have hardened. S. noctilio are not killed by the nematode, they undergo “parasitic castration.” Parasitized female S. noctilio emerge from trees as adults, mate, and search for suitable pine trees in which to oviposit. During oviposition, they inject fragments of the symbiotic fungus into the wood, along with phytotoxic mucous and eggs, which are at that point full of nematodes instead of woodwasps. Once the nematodes are injected into the tree by the female host, they return to the fungal feeding form. 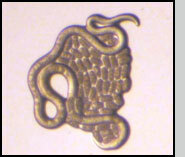 Male S. noctilio are considered a dead end for the nematodes, as they cannot transmit the nematodes to females during mating. To mass produce the nematode for biological control, cultures of the symbiotic Sirex noctilio fungus are established in flasks and inoculated with the fungal-feeding stage of the nematode. The nematodes are given time to grow and reproduce, at which point they are ready to be harvested and inoculated into trees in the field. Before nematodes are released, trap trees are made to attract S. noctilio. This is achieved by injecting herbicides into trees, which slowly kills them and makes them both attractive and highly susceptible to infestation by the woodwasps. The trees are injected three months before the S. noctilio are expected to emerge, and once infestation of the trap trees by the woodwasps is confirmed, nematodes are introduced. A special hammer is used to punch holes into the trees, and the nematodes, suspended in a gel, are injected into the holes of the tree. Infected S. noctilio then transfer the nematodes to subsequent trees. These inoculations have been carried out in control programs with great success in Tasmania and Australia. It is estimated that the control program, which includes the use of the nematode, saves an estimated $16-60 million USD per year in Australia. It is also estimated that a control program including nematodes saves $6.6 million USD per year in Brazil. Success has not been universal, however, as some releases of nematodes in South Africa and South America have not lead to satisfactory control of S. noctilio. A number of possible explanations have been proposed, a few of which are climate, the presence of a defective strain of the nematode, or poor inoculation technique. Identifying what could be confounding the biological control system is an active area of research. Bedding, R.A., 2009. Controlling the pine-killing woodwasp, Sirex noctilio, with nematodes. In: Hajek, A.E., Glare, T.R., O’Callaghan, M. (Eds), Use of Microbes for Control of Invasive Arthropods. Springer, Netherlands, pp. 213-235. Hurley B. P., B. Slippers & M. J. Wingfield, 2007. A comparison of control results for the alien invasive woodwasp, Sirex noctilio, in the southern hemisphere. Agricultural and Forest Entomology 9, 159-171.